Dr. Thomas's research interests relate to cardiac structure and function. More specifically he has been interested in adaptations made by the heart to both physiological and pathological overload. Exercise, a physiological overload, places tremendous stresses on the heart, and his laboratory has been studying acute effects and chronic adaptations that the left ventricle makes to these stresses both in terms of cellular (myocyte) and intracellular adaptations as well as the vasculature, microvasculature, and extracellular space. 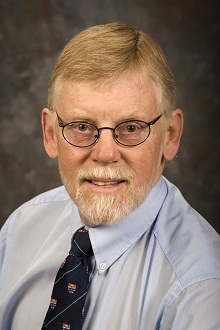 In collaboration with Richard McCormick, Ph.D., in the Department of Animal Science at the University of Wyoming, he has been studying both pre- and post-translational modifications of collagen induced by aging, exercise, and myocardial infarction. He has examined interactive effects of myocardial infarction and exercise training on extracellular matrix characteristics of the left ventricle. As the depressed myocardial function associated with a heart attack can result in altered peripheral vascular function, he has also been studying this phenomenon in collaboration with Professor Hudlicka at the University of Birmingham Medical School, in the UK. Thomas, D.P. [PI], Li, J. [Co-PI] (05/09-5/10). Glucose transporters regulated by AMP-activated protein kinase. University of Wyoming, College of Health Sciences, Summer Seed Research Grant (funded $7,500). Li, J. [PI], & Thomas, D.P. [Collaborating Investigator] (04/08-04/09). Alterations in Cardiac Adaptive Response to Ischemia/Reperfusion with Aging. P.H.S. - NIH R-15 (funded $100,000). Doser, T.A., Turdi, S., Thomas, D.P., Epstein, P.M., Li, S., & Ren, J. (2009). Transgenic overexpression of aldehyde dehydrogenase-2 rescues chronic alcohol intake-induced myocardial hypertrophy and contractile dysfunction. Circulation, 119, 1941-1949. Fang, C.X., Dong, F., Thomas, D.P., He, L., & Ren, J. (2008). Hypertropic cardiomyopathy in high fat diet-induced obesity: Role of suppression of forkhead transcription factor and atrophy gene transcription. American Journal of Physiology: Heart Circulation Physiology, H00319-H00329. Ren, J., Duan, J., Thomas, D.P., Yang, X., Sreejayan, N., Sowers, J.R., Leri, A., Kajstura, J., Gao, F., & Anversa, P. (2008). IGF-1 alleviates diabetes induced rhoA activation, eNOS uncoupling and myocardiac dysfunction. American Journal of Physiology: Regulatory Integrative Comparative Physiology, 294, R793-R802. Norton, G., Veliotes, D., Osadchii, O., Woodiwiss, A., & Thomas, D.P. (2008). Susceptibility to systolic dysfunction in the myocardium from chronically infarcted spontaneously hypertensive rats. American Journal of Physiology: Heart and Circulation, 294, H372-H378. Hwang, H.S., Cirrincione, G., Thomas, D.P., McCormick, R.J., & Boluyt, M.O. (2007). Aldosterone antagonism fails to attenuate age-associated left ventricular fibrosis. Journal of Gerontology: Biological Sciences, 62A(4), 382-388.
alleviates diabetes induced rhoA activation, eNOS uncoupling and myocardiac dysfunction. American Journal of Physiology: Regulatory Integrative Comparative Physiology, 294, R793-R802. Waggy, E., Wang, J., Armstrong, C., Heng Ma, J., Li, J., & Thomas, D.P. (2009, May). Effects of endurance training on amp-activated protein kinase (ampk) activity in the heart. Poster presented at the annual meeting of the American College of Sports Medicine, Seattle, WA. Keele, J.A., Stayton, M.M., Harpster, M.H., Bandyopadhyay, S., McCormick, R.J., & Thomas, D.P. (2007, May). Regulation of Nitric Oxide Production by L-arginine Induction in the Heart following Myocardial Infarction. Paper Presentation at the American Heart Association Scientific Conference Cardiovascular Repair and Regeneration: Structural and Molecular Approaches in the Cellular Era, Keystone, CO.